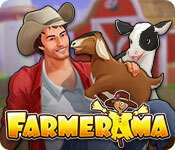 Enjoy country livin’ at its best in Farmerama! Cultivate, fertilize and harvest your crops. Raise livestock and trade with other farmers. Work hard to take home the blue ribbon as farmer of the year!